As you probably read in the headliner I'm back. It took me quite a while to switch from *holiday-mood* to the *working and going to school-mood*. 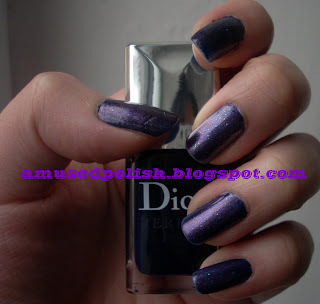 The NOTD I'm going to show you today is Dior Rose Boreale layered over Dior Poison Blue. I showed you Poison Blue itself here. 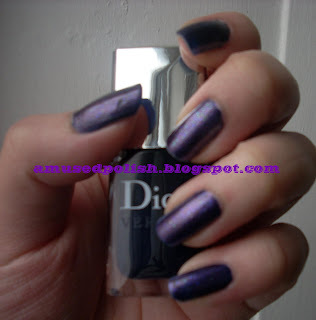 The reason I got this polish was when I saw swatches on Nora's blog, Nail Of the Week. After that I had another lemming and knew I would own one bottle sometime. To the application: In my opinion the brush was a bit on the stiffer side- I know there are much worse polish-brushes outside there but thankfully it didn't had any effects on the painting. Poison blue was quite opaque on the first coat but to smooth out the little mistakes I made during application I painted second thin coat. After that I layered Rose Boreale and the magic happened^^. From an almost-black to an purple (and you may know how much I'm a sucker for purples). PS: There's an awesome giveaway at Sawan's Blog, check it out here. Ebay, why do you have to do this to me?